(Rome) Does the reclassified Congregation of the Faith act as a stooge of dubious fighting by the papal environment against critics of Pope Francis' administration? The term "Pelagianism" in the new document of the Congregation of the Faith raises questions. 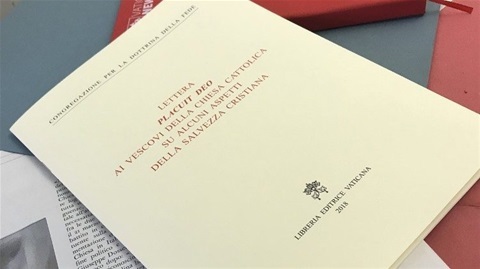 Yesterday, at a press conference of the Roman Congregation for the Doctrine of the Faith, the new document Placuit Deo "on some aspects of Christian salvation" was presented to the Vatican . The presentation was made by the beginning of July 2017 by Pope Francis newly appointed faith prefects Luis Ladaria Ferrer SJ. He became the first Jesuit secretary of the Congregation of the Faith in 2008. With the surprising, but not entirely unexpected dismissal of the faith prefect Cardinal Gerhard Müller, Curia Archbishop Ladaria moved to the top of the congregation. Just as Pope Francis is the first Jesuit of history on the Pope's throne, so since then, with Msgr. Ladaria, the prefect of faith has for the first time been a Jesuit. The new document will be discussed in detail. At this point, only one point should be addressed. On 5 September 2016, Pope Francis wrote a letter to Msgr. Sergio Alfredo Fenoy, Bishop of the ecclesiastical Province of Buenos Aires. The Pope praised in this the pastoral guidelines for the implementation of the controversial post-Synodal letter Amoris laetitia , which had been prepared by the bishops of his former ecclesiastical province. The guidelines provide in certain cases for the admission of remarried divorced persons to the sacraments. For a clear answer to this point, Francis had since the summoning of the Synod of Bishops on the family in the summer of 2013 pushed. "The text is very good and explains exactly the meaning of the eighth chapter of 'Amoris laetitia'. There are no other interpretations. " The existence of the letter was initially denied , then somehow admitted. There was uncertainty about its relevance. High-ranking critics of Amoris laetitia spoke of a private letter , which, although it reflects the personal opinion of the pope, was of no importance to the universal Church. A year later, in December 2017, a journalist discovered that the "private letter" including the guidelines of the ecclesiastical province of Buenos Aires had already been published in June 2017 in the Acta Apostolicae Sedis 1) . In a rescriptum ex audientiaCardinal Secretary of State Pietro Parolin noted on 5 June 2017 that the publication was at the express request of Pope Francis. Thus, the Buenos Aires interpretation approved by the pope had quietly become part of the "authentic" magisterium. Also the sentence: "There are no other interpretations". Francis had thus decided in his own way the persistent, violent conflict of interpretation, although for months he had refused to answer questions, requests and appeals for the interpretation of Amoris laetitia . Shortly before the official publication of the quasi-secret "private letter" to the Bishops of Buenos Aires, he had even in spring 2017 the four cardinals of Dubia even denied the audiencefor which they had asked to clarify the question. Instead, he received a hitherto unknown Catholic, who had criticized the Dubia as " satanic abuse ". Of course, when Francis wrote, "there are no other interpretations," he knew that there was not just one interpretation, but that his writing had brought Amoris laetitia the greatest confusion into the church. The interpretations differ since its publication from Episcopal Conference to Episcopal Conference and often even diocese to diocese . Placuit Deo and two "deviations"
"Pope Francis in his ordinary teaching has often referred to two tendencies which are related to the just indicated deviations and in some respects have similarities with two ancient heresies, namely Pelagianism and Gnosticism." "The pope's concerns: 'Restorative powers', 'Pelagianism' and 'Gnosticism'". He revisited the topic on 28 July 2013 in his speech to the Latin American Council of Bishops (CELAM) in Brazil. Even then his allusions and criticisms raised more questions than they answered. It should remain until today. It became clear that Pope Francis holds the forces of tradition for "Pelagians". The Pope's worries about "restorative powers"
What used to be only part of more or less respected papal languages ​​and spontaneous speech has found its way into an official document of the Congregation of the Faith with Placuit Deo . "In our day, a new Pelagianism thrives, according to which the radically autonomous individual pretends to redeem himself without acknowledging that in the depths of his being, he is dependent on God and others. Salvation, therefore, is expected of the forces of the individual or of purely human structures, but unable to accept the novelty of the Spirit of God. One kind of New Gnosticism, for its part, propagates a purely inward salvation enclosed in subjectivism, which consists in the understanding "rising beyond the flesh of Christ to the mysteries of the unknown deity". Thus the claim is made to liberate the person from the body and from the material world, in which one no longer recognizes the traces of the providence of the Creator, but only a reality without meaning, which would be foreign to the actual identity of the person and could be manipulated according to the discretion of the person. It is clear, of course, that the comparison with the heresies of Pelagianism and Gnosticism is only intended to indicate general common features without making an assessment of the exact nature of the old errors. The difference between today's historical context marked by secularization and the situation of the first Christian centuries in which these heresies emerged is great. But because Gnosticism and Pelagianism are enduring threats to a misunderstanding of biblical faith, it is possible to find some similarity to the tendencies of our time just described. " that the comparison with the heresies of Pelagianism and Gnosticism will only suggest general common features without making an assessment of the exact nature of the old errors. The difference between today's historical context marked by secularization and the situation of the first Christian centuries in which these heresies emerged is great. But because Gnosticism and Pelagianism are enduring threats to a misunderstanding of biblical faith, it is possible to find some similarity to the tendencies of our time just described. " that the comparison with the heresies of Pelagianism and Gnosticism will only suggest general common features without making an assessment of the exact nature of the old errors. The difference between today's historical context marked by secularization and the situation of the first Christian centuries in which these heresies emerged is great. But because Gnosticism and Pelagianism are enduring threats to a misunderstanding of biblical faith, it is possible to find some similarity to the tendencies of our time just described. " The difference between today's historical context marked by secularization and the situation of the first Christian centuries in which these heresies emerged is great. But because Gnosticism and Pelagianism are enduring threats to a misunderstanding of biblical faith, it is possible to find some similarity to the tendencies of our time just described. " The difference between today's historical context marked by secularization and the situation of the first Christian centuries in which these heresies emerged is great. But because Gnosticism and Pelagianism are enduring threats to a misunderstanding of biblical faith, it is possible to find some similarity to the tendencies of our time just described. " The document of the Congregation of the Doctrine of the Faith cites no concrete examples of the "deviations" of "Neo-Pelagianism" and "Neo-Gnosticism". This is not only surprising, but also has a worrying grade. Since the vague first mention of the term "Pelagian", which is supposed to characterize an actual or even supposed phenomenon, Pope Francis uses it as an accusation against his critics. This is even more evident in its environment. The term "gnosis" seems to simulate only a "balancing" impression, as it is known from the dialectic, for it was used even more imprecisely by Francis and placed in no concrete context. So it seems to be primarily about a club that Bergoglians have used extensively in recent months, since the publication of Amoris laetitia , to attack those critics of Pope Francis who are seriously concerned but respectful of an interpretation of Amoris laetitia according to the everlasting ecclesiastical Demand tradition. What, then, does the Congregation of the Faith mean by taking up and blatant this, on the one hand, vague but at the same time diffuse impeachment of Pope Francis, which until then had been used primarily as a combat instrument? What should be the purpose of this? Should the club receive highly official character against critics of the papal office? "While the Prefect of the Faith, Archbishop Luis Ladaria, has given no examples of Neo-Pelagianism, the Pope refers to those who accused him of breaking the teaching of the Church by offering communion to the remarried divorced. " "Vatican announces new condemnation of an ancient heresy". As expected, the emphasis is not on "neo-Gnosticism" but on "neo-pelagianism", as the caption and the first paragraph clarify. This leaves no doubt as to how the editors understand the Roman document and how readers should understand it. It is foreseeable that more such reports from other progressive media will follow. The battle concepts "Pelagianism", "Pelagian", "Pelagian", which even most Catholics can not put into any objective, historical context, undergo a reinterpretation. It is not only expressed in the term "Neo-Pelagianism". The document Placuit Deo and the reaction of the tablet show that they get even more meaning. The document of the Congregation for the Doctrine of the Faith, which came about at the obvious request of Pope Francis, signals that Francis and his environment are set for relaxation in the face of the communist regime of the People's Republic of China , but not within the Church.